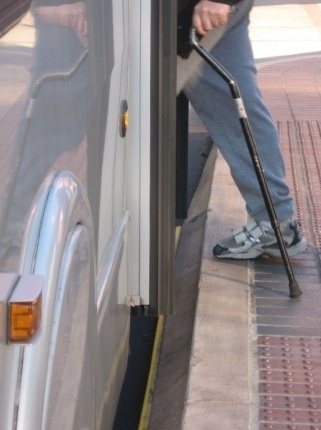 The ability of Bus Rapid Transit systems to serve persons with disabilities in less wealthy countries seemed obvious at first glance. The earliest graphics of BRT trunk lines in Curitiba, Brazil, depicted wheelchair users crossing boarding bridges into articulated buses. Problem solved! 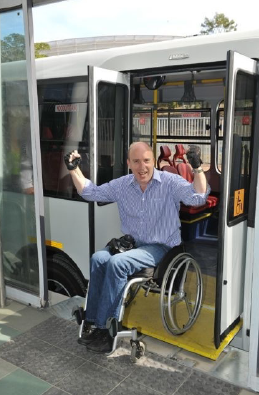 Thus, years later, many may be surprised to find cities where wheelchair users are unable to access one or another BRT system. Other beneficiaries of universal design – including older persons, women, children, and those with hearing or sight impairments – are often not heard from. They just quietly decide they cannot use Bus Rapid Transit to get where they need to go. What happened? Why have the apparent advantages of BRT systems become problematic in many cases? It turns out the devil is in the details. But first, the positive news. Bus Rapid Transit trunk lines are indeed a historic step forward, especially in cities in developing countries where they may represent the first large-scale application of inclusive design to any public transit system. Accessible sidewalks, curb ramps, grade-level crossings, tactile guideways and tactile warning strips all make their appearance, along with visual and audio signage and, above all, floor-level boarding – features which are there to be witnessed and copied elsewhere for decades to come. Along with these advancements come safer and better lit stations, easier fare payment, and other features that meet the needs of seniors, women, children, tourists, blind persons, those with low vision, and people who are deaf, deafened, or hard-of-hearing. From this perspective, a well designed BRT system can appear to be an island of accessibility in the midst of a sea of inaccessibility. And therein lies part of the problem: the different elements of universal access are often considered in isolation from each other when, in fact, they all form the social, operational, and built environment required for an accessible trip chain from trip origin to the BRT trunk line, into the bus, and on to the trip destination. To illustrate how the details of design, operation, and outreach interact, we are presenting three composite case studies* of the experience of typical passengers in Latin American, Asian, and African cities. * Click here for full article from Access Exchange International in San Francisco.